We LOVE using Templates. I have quite a big collection of templates that we have printed and cut out (we always print ours out on cards just because we use them so often). I love using templates because it encourage the kids to get involved even if they cannot draw the shape they want free hand. And when you use templates the kids practice tracing around the shapes (which for younger ones takes some practice as they have to keep the template still while they trace) and they get to practice cutting out all kinds of shapes. I also always remember being told that using stencils is a great way for kids to engage both hands – in other words that non-dominate hand has to work together with the dominate hand – and I always think the same thing applies with templates – they are actively using both hands. Plus using a template is always a fun excuse to do some experimental art. We recently bought some new tube watercolours – we normally stick to a set of block watercolours so the kids were a bit excited about this new form of watercolours and wanted to play around. I suggested we get the pipettes out – thinking we could use them to create some coloured patters on paper. Total idea fail !! But my youngest had a blast with the pipettes, mixing all types of colours and creating what I can only describe as a watercolour pool. My oldest liked the idea of creating some colour patterns so we got out our old trusty paint dabbers and used those instead. It allowed the watercolours to mix together on the page but restricted all the excess water that using the pipettes seemed to result in and after my son got tired of his watercolour pool he also joined in. We did get some nice coloured pages. Just to compare I later used our acrylic paints to see if I could get the same result – the colours were bright and bold but I thought the watercolours allows more colour mixing and blending. In the photo below the page on the left is watercolours and the page on the right is with acrylic paints. We let our pages dry properly and then the kids selected some templates and all the tracing and cutting started. And I must admit that using the templates really ended up being an excellent cutting skills session for my son. He tried to cut out some detailed shapes that he probably would not normally have attempted and did surprisingly well. In fact after getting one more difficult shape cut out, he was so chuffed that he purposely went to look for a harder template to trace and cut just to see if he could manage. In this one we actually used the teardrop tree template but just cut off the trunk (my daughter thought that way it would look like petals) and then created a flower. 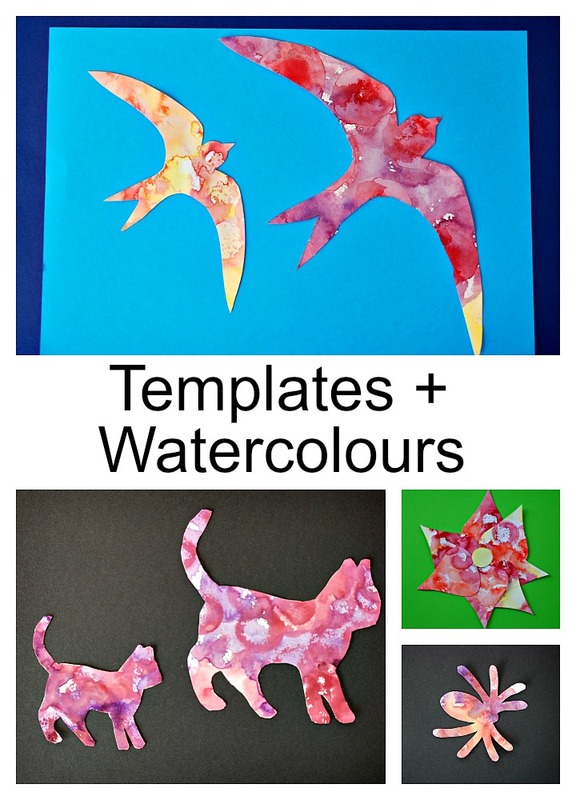 This entry was posted in Art and Craft Ideas and tagged activity village, animal art, children's art, home ed, home education, homeschooling, template art. Bookmark the permalink. I love templates, too! These are fun!